If you are looking for Boiling Water Bath Canning Instructions and regulations for using a canner for jams, jellies and conserves/preserves, you have come to the right place! Here (scroll down) are the basics of How to Use a Canner for canning rhubarb, and other vegetables, jams, jellies and more! The U.S. Department of Agriculture recommends the following procedure for Boiling Water Bath Canning for jams, jellies, and conserves. 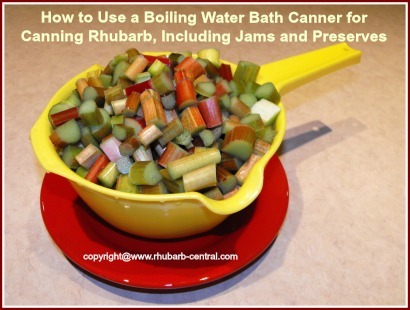 If you are looking for more information on How to CAN rhubarb (including recipes for rhubarb CONSERVES/PRESERVES), or amazing recipes for rhubarb JAMS and JELLIES, scroll to the bottom of this page for links to these pages. Jelly is ready to be canned when it reaches 220° F on a jelly or candy thermometer. If you don't have one, use the old-fashioned sheeting method. Put 1 tablespoon of the hot fruit mixture on a cold plate or spoon, then turn the plate or spoon on its side over the sink. If the mixture "sheets of" (falls off) in one large drop, the jelly is done. Jams are ready when a spoonful of fruit dropped in a cold bowl holds its shape. For preserves and conserves, a spoonful of the mixture should hold its shape or mound up on a cold spoon or plate. Here below are canning supplies which can be ordered online at *Amazon.com. Click on the images for more detailed product information and helpful customer product reviews.